Welcome welcome. So many great links last week. Y'all are one creative and smart bunch. Let's take a look at just a few features. Des from Peeking Thru the Sunflowers revealed her gorgeous master bedroom. I Gotta Create shared some pictures of a backyard visitor. While we are talking about critters just look how cute this dresser is. You must see how this was done by Dear Emmeline. 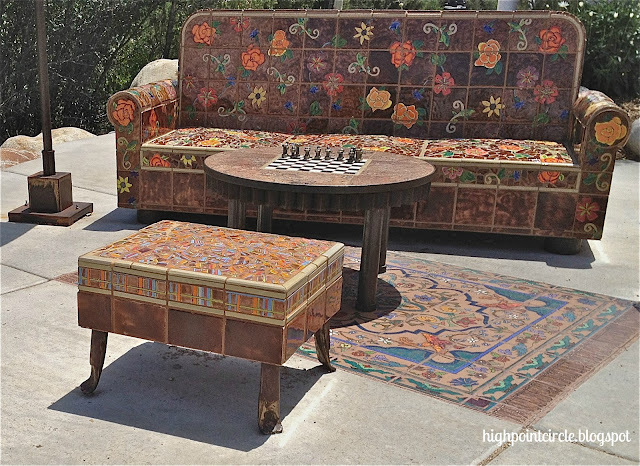 Highpoint Circle shared this mosaic covered furniture that she saw while out of town. This is the cutest potting shed that was a potty shed a.k.a. outhouse in its former life. You can find out more at Up Country Olio. What a great idea to give new life to an entry closet. 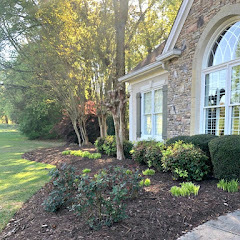 Check this transformation out by Woven Home. 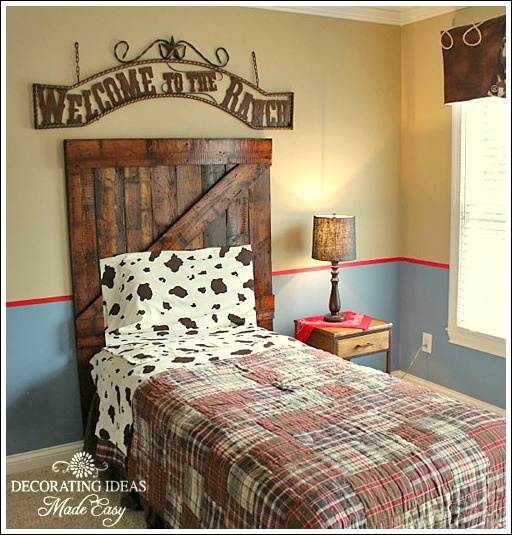 Cute DIY headboard by Decorating Ideas Made Easy Blog. Love the bedding. 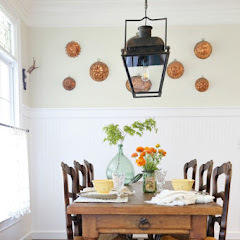 Amanda of Dixie Delights never disappoints with her beautiful home and her kitchen is no exception. Just gorgeous. 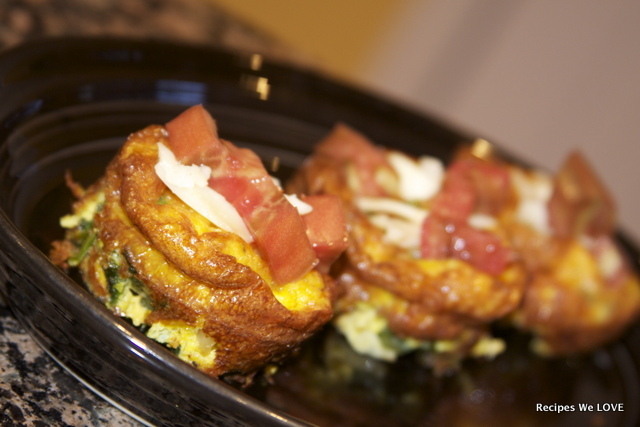 Yummy breakfast quiche muffins recipe shared by Recipes We Love. Thanks so much to everyone who joined last week and if you were featured you can grab a "featured" button from my sidebar. I have been way out of the loop since we have been at the lake. I caught up with your posts this evening. Absolutely love the guest room makeover. The sleigh bed is wonderful painted. Might have to try that with ours. Of course, I love the cabinet red...wonderful! Wow, I could spend all night checking out the features alone. 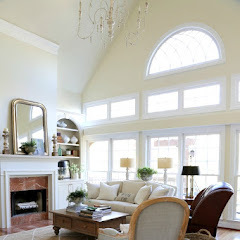 Some I've already seen, but that ruffle bedspread at the top was so great, I love seeing it again. Thanks so much for having such a great party. Hello Kim! Thank you very much for hosting! Great features as usual. That quilt with vintage sheets...that dresser... I will begin visiting such creative bloggers. Great features Kim, they are so unique. I think bloggers get more creative everyday. 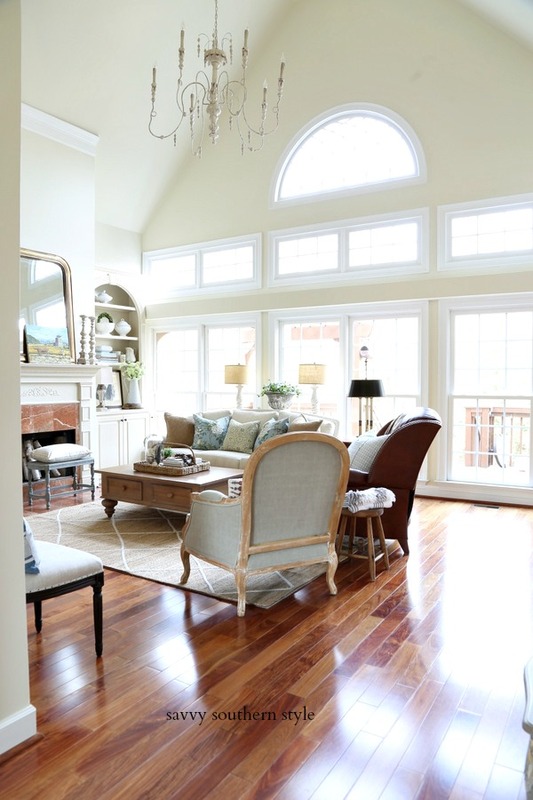 Your guest room should be in a magazine, it's gorgeous, as is the rest of your home. Thanks for hosting WOW! I too love the guest room! When do you have availability? :) Thanks for hosting! 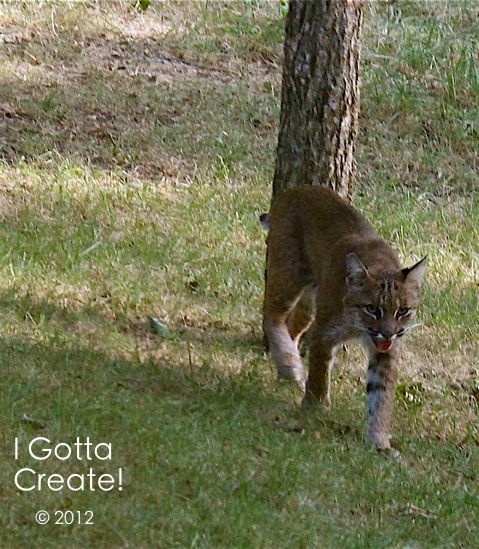 That bobcat looks skinny and hungry! 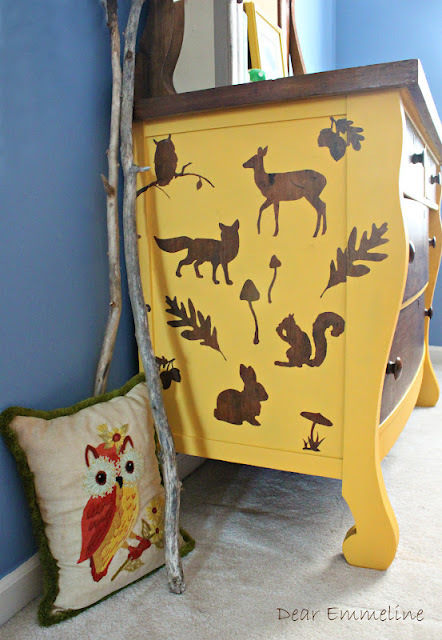 Love the critters on the yellow dresser! Thanks for hosting! Great features this week Kim and thanks for hosting! That ruffle bedspread caught my eye too. Great features, Kim. Thanks for hosting. ... the wine is poured and the mouse is at the ready to click away! Great features, love the ruffled quilt just beautiful and the kitchen~oh my, who wouldn't love one just like that! Thanks for hosting and have a fabulous week. What a cute ruffled spread! Thanks for hosting Kim! There is so much talent out there! What a colorful selection of features this week...thanks for hosting as always, Hope you summer is refreshing! Great features Kim. I love the potting shed. Thanks for hosting. Great features, Kim! Thanks a bunch for hosting! Thanks Kim for the fab par-tay! Ya know, every week I'm just blown away by all the talent of so many wonderful women. I get so inspired and then wish I had more hours in the day to work on more projects! Sigh. Anywho, thanks for hosting! Can't wait to start browsing - great features also btw! Trying to figure out how the paint popped off your address sign like it did and making the scratching sounds ! I love that quilt. Thanks for hosting. Fabulous features Kim!!! Thanks for hosting! Great features Kim ! Thanks so much for hosting the party:) I hope you will join in on the party I'm having on the 1st of the month. I would so love to have you ! Okay, I'm off to see what everyone has been up to!!!! Great features Kim. Love, love that potting shed of Lynn's! Thanks for the party. Hope you are having a great Summer. Lovely features this week. Infact they are always terrific. Thank you so much for featuring my ruffled quilt I made out of vintage sheets. It was a fun surprise to find as I came to read your blog tonight. Fantastic features~ thanks so much for hosting! Thanks so much for hosting us Kim! so much great reading, so many talented bloggers, so much beautiful!! Love the look of those breakfast muffin cups, yum! The quiche muffins look so good! Great links here! Thanks so much Kim! 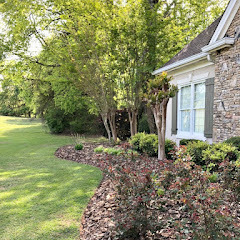 Kim, thanks so much for featuring my back yard visitor! She was a real beauty!! Thanks for hosting Kim! Those are some awesome features! The bedspread is my favorite! LOVE your features this week! The ruffle quilt is just amazing! I love reading your blog and enjoy seeing how creative you are. Kim, Thanks so much for hosting each and every week! What wonderful features Kim. That ruffled bedding is fabulous! As someone who makes mosaics, I just gotta say that mosaic couch is the craziest thing ever (in a fun way)! Thanks so much for the feature! So exciting!! Wow those are some fun features, I'm drooling over that ruffly bedspread!. Thanks for featuring my potting shed too! This is Melissa @ Daisy Mae Belle. LOVE that ruffled quilt! I am about to go check it out! Thanks for hosting! Such wonderful inspiration here, Kim!!!!! I am loving Danielle's bedspread! Thank you so much for hosting!! Happy Wednesday. I love the ruffled quilt. Hi Kim: Thank you for hosting today--I love the features you selected. That ruffled quilt is so beautiful, and the quiche muffins at the bottom I'd love to try! Great features.LOVE that ruffled bed.And the bedroom make over is beautiful too.Love that kitchen.Oh those muffin quiche look delicious!!! Thank you for hosting! Thank you for hosting! Always so many beautiful things to see here. Happy to be back at the party! 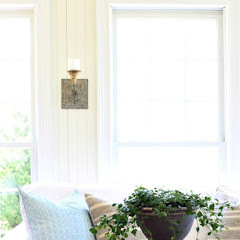 I love the ruffled coverlet in the first photo, very cute. Off to check out some of the links for the week. Thank you for hosting this awesome linky, I am kinda new to all this, but slowly catching on. Wow, I'm #330, only 3 hours after the party started! That's awesome, such a great turn-out, and such great inspiration! 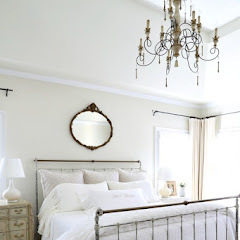 Love all the features, but the ruffled bed spread is gorgeous! Thanks for hosting! I would love to have that old outhouse in my garden - not that I have the space. I just love the idea of a little room all to myself.